but national stereotypes aside, we manage to get along just fine. Case and point: my friend Aaron and I. 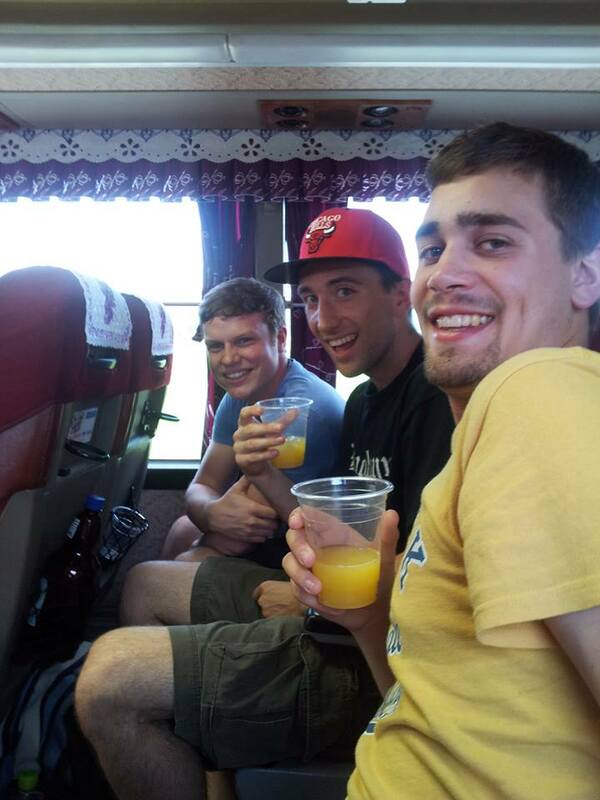 We met each other in South Korea of all places in the same teacher orientation group, and we struck up a friendship through long bus rides and making terrible puns together. 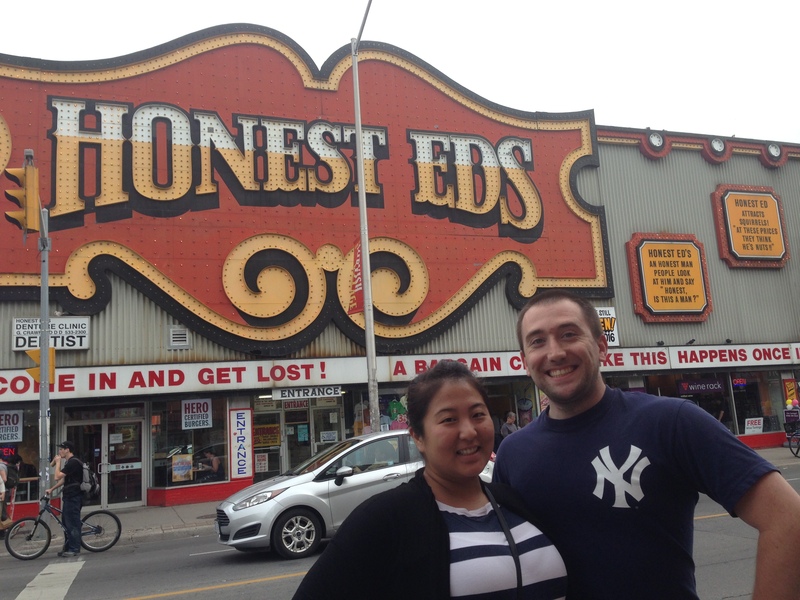 After Aaron and his gf, Alyssa, visited Chicago, Janice and I decided to pay them a visit up in Toronto, a place neither of us had visited. So, our adventure started from Chicago super-early in the morning with driving through a whole lot of nothing until we reached Canada. 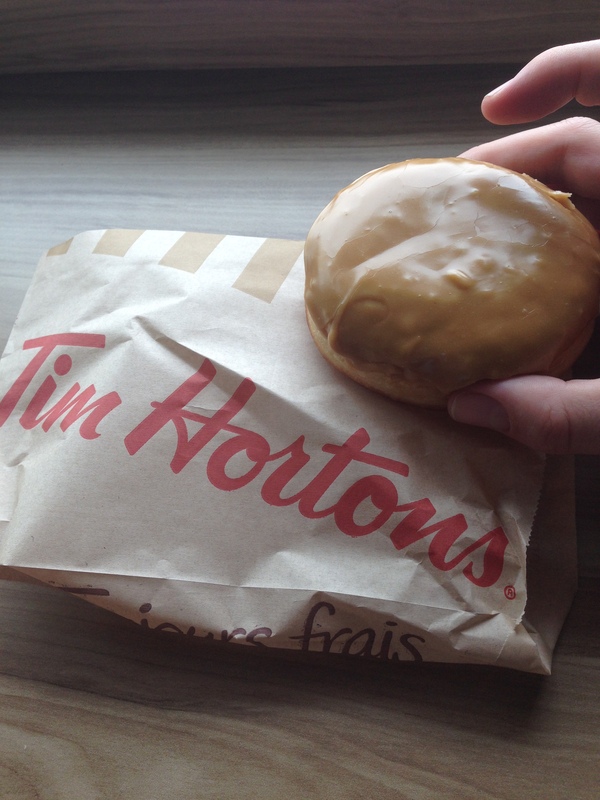 Once we crossed the border, we stopped for a sweet piece of Canada in the form of Tim Hortons. Although there are now branches throughout the Northeastern USA, they haven’t arrived in Chitown. So, we wanted to see what all the hubbub was about. it looked like a fancier fast food diner, and I knew that this Canadian institution specialized in having great coffee and doughnuts. I got a Canadian maple, tres Canadien!, and Janice got the sour cream glazed. Janice was less than impressed due to the too sugary treat that didn’t match up to a similar, yet less diabetes inducing version in Chicago. As for mine, I found it to be enjoyable even though I’m not partial to cream filled pastries. Thankfully there was more fresh, fried dough than cream, and the maple icing was delectable. 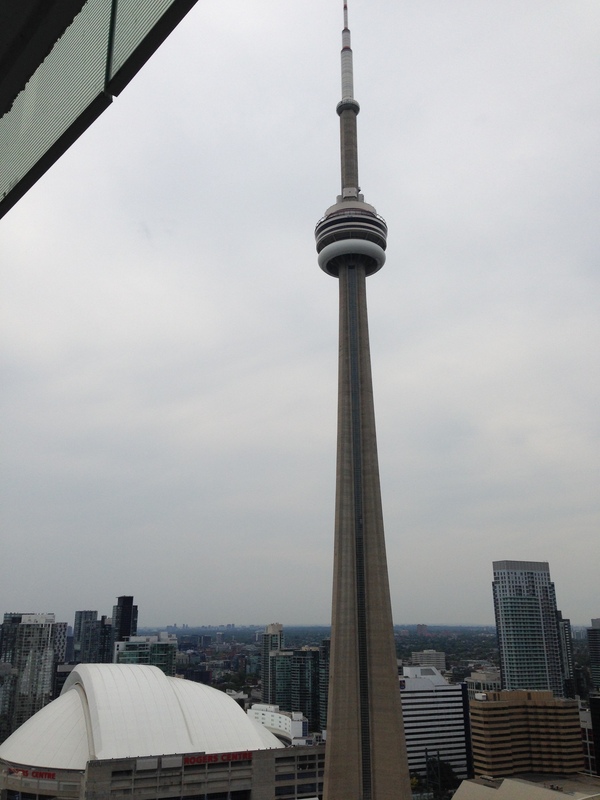 Once we finally reached the city and trying not to die with all of the crazy Canuck drivers. We got to our apartment with a sweet view that would make even Drake jealous, and then proceeded to meet up with Aaron and Alyssa. 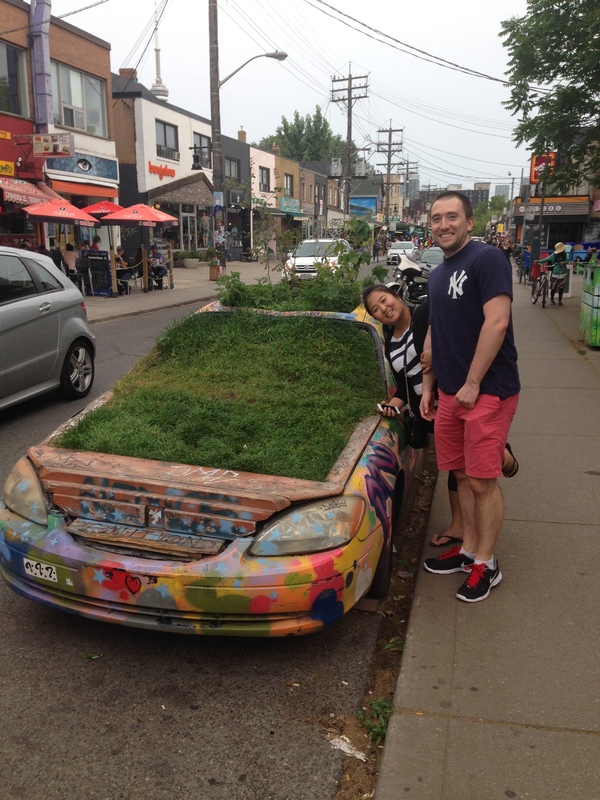 We walked all over the town as they showed us the sights that ranged from Korea Town that actually had a lot Aaron and I recognized from our time in the Land of the Morning Calm to the Kensington Market that seemed like a Caribbean island market in the middle of a modern metropolis. 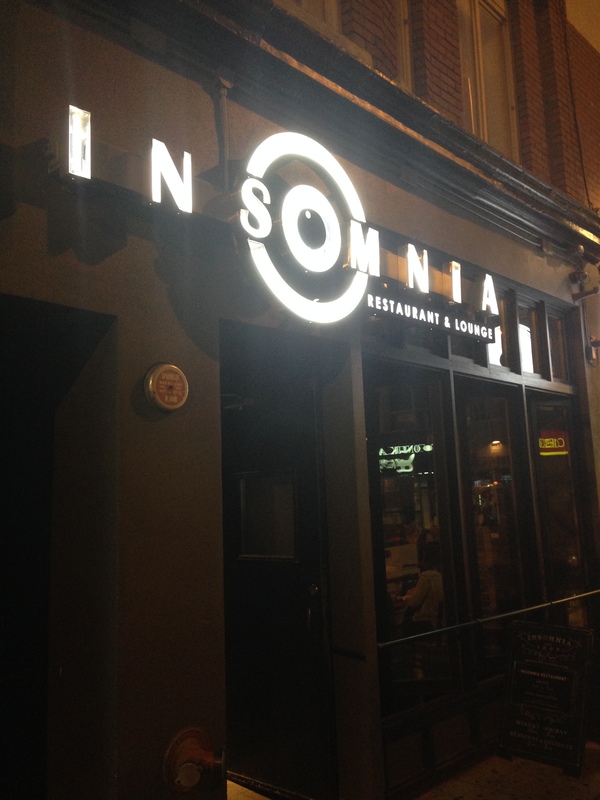 After traversing what seemed like half the city, we managed to get our final destination (no, not death like the movies), Insomnia Restaurant & Lounge. Unfortunately, it was super busy, so we had to wait for a table. 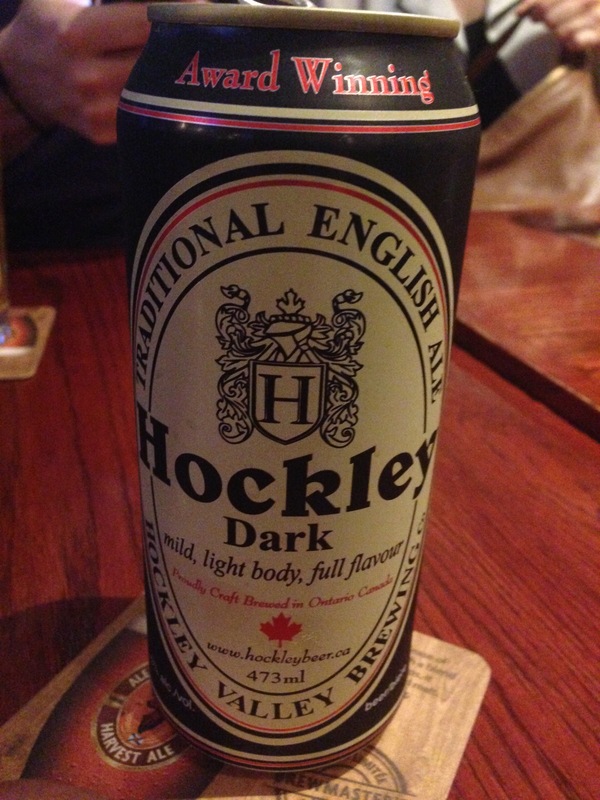 We hit up the bar next door, and I tried a new Canadian beer I never heard of: Hockley dark. It was a traditional English ale that was full bodied with a clean, caramel aftertaste that my compatriots likened to a lighter Guinness, or as they say on their website, “a brunette with the body of a blonde”. We eventually got the call to head on over to Insomnia. 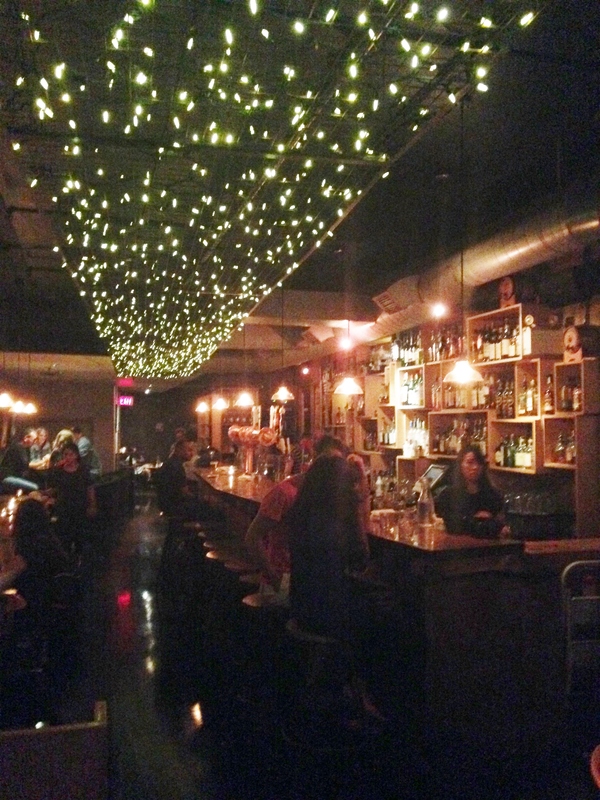 It looked like any other gastropub with the addition of some Christmas lights overhead. However, our table was quite different mainly due to the super comfortable easy chairs that made the dining experience that much more enjoyable. The reason why we chose Insomnia over all of the restaurants in Toronto is that they were part of the Summerlicious food festival which was similar to Chicago’s restaurant week that Janice and I greatly took advantage of. 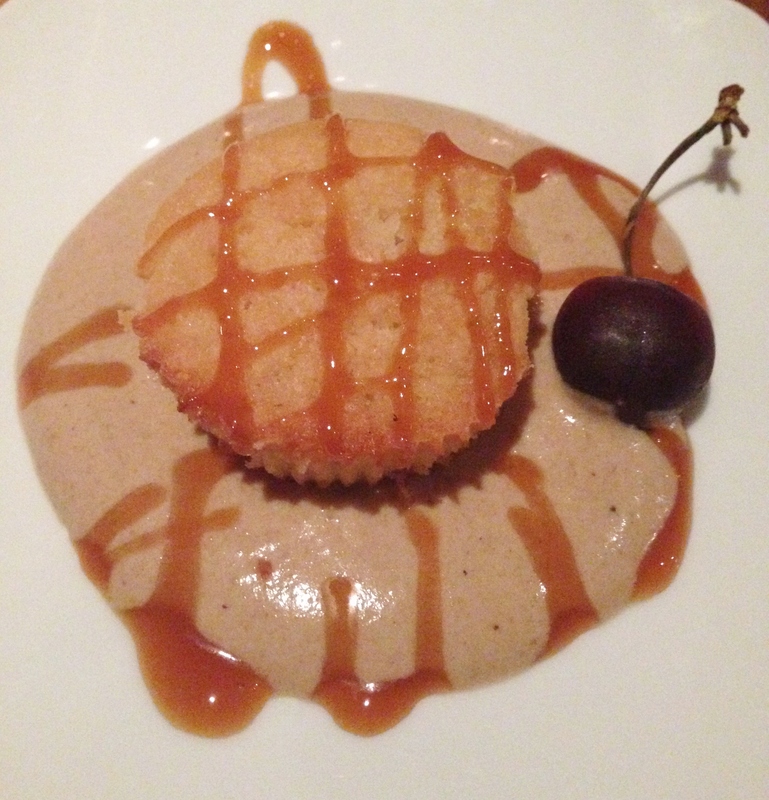 Just like Chicago’s restaurant week, there was a set menu that consisted of a starter, entree, and dessert for $25. 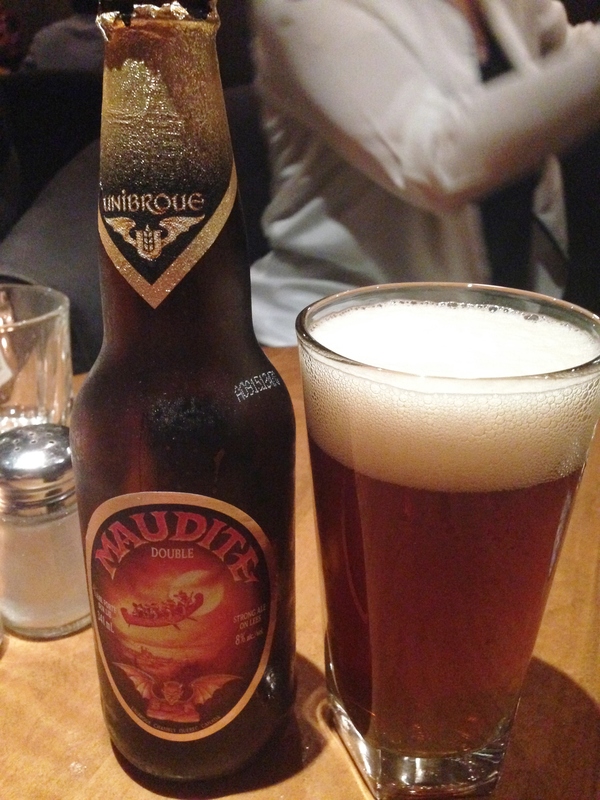 I started the meal with a Maudite Belgian Strong Ale. If you love lambics or dubbels or Belgian beer in general, I highly recommend this spicy yet fruity brew. Then looking over the menu, there was a ton of great picks for food which made it all the more difficult to choose just one item. 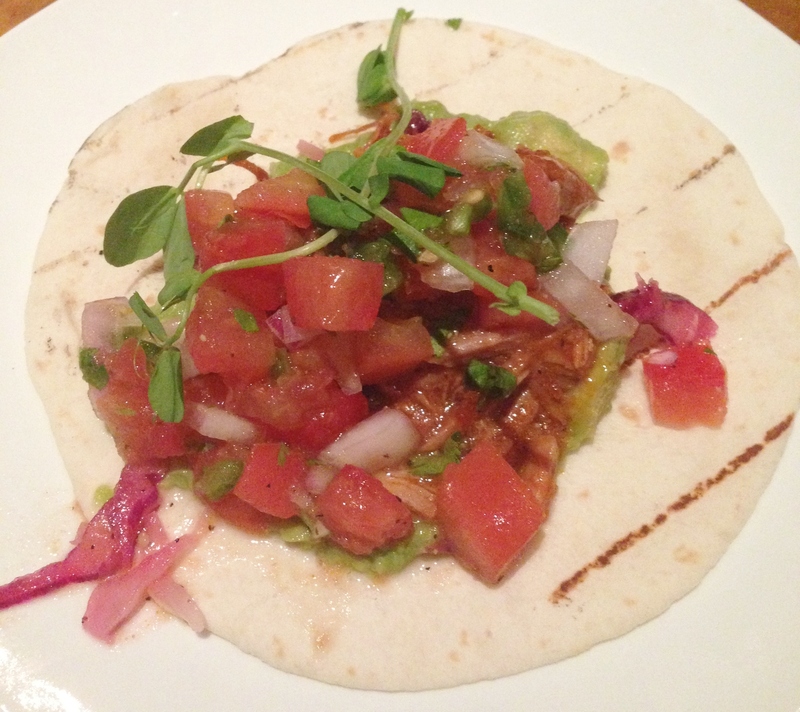 I, along with everyone else I think, got the pork taco since it was the most interesting appetizer. It looked super fresh yet simple. All it consisted of was seasoned, tender, yet slightly spicy pork, pico de gallo, some cabbage, and a creamy, rich avocado spread. The cilantro sprigs made it all the better since I love the controversial herb. Then came the entrees. I was torn between the burger since I had a hankering for one, and the Dirty Dirty South fried chicken and waffles. However, I wanted something a bit different, so I went for the latter. Funny enough, Janice, Alyssa, and I all got the chicken while Aaron got the burger. He was greatly satisfied with the juicy Ontario ground chuck, milk bun, and classic lettuce, onion, pickle combo. 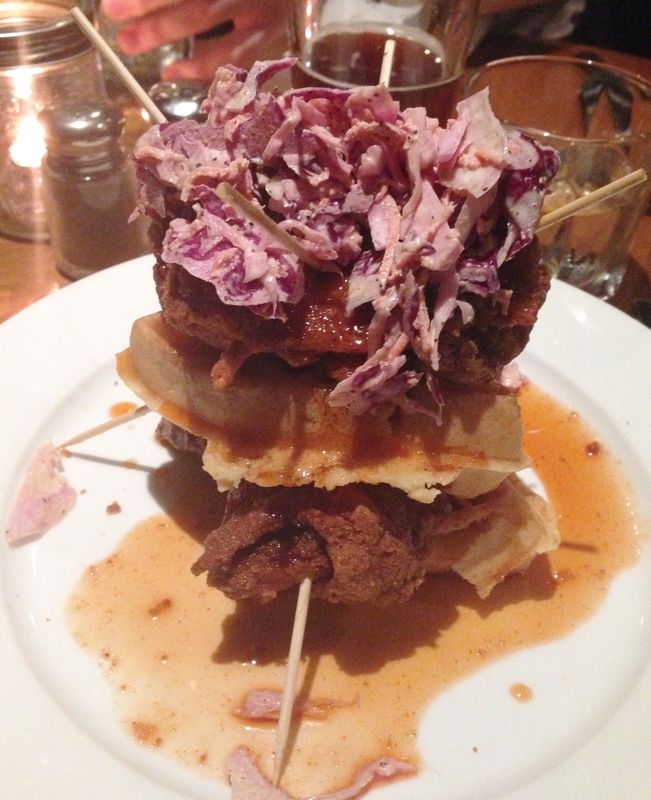 Our chicken and waffles, on the other hand, were a different beast all together. When it came out, it looked like something inspired from the Spanish Inquisition or Vlad the Impaler. Our waffles were pre-cut into quarters and alternated with the boneless chicken thigh pieces in a large stack that was held together with a series of wooden skewers. Atop this unique creation was one of my most disliked foods: cole slaw. I love my cabbage products like kimchi or kapusta, but I dislike the cream picnic staple. I slowly took apart the tower o’ food with the precision of playing the popular game Kerplunk and sliced into my meal. It was a mouth-watering combo of thick, fluffy waffles and non-greasy but still flavorful pieces of all white meat. The honey maple butter and maple syrup made this plate the ideal mix of savory and sweet. I highly recommend this entree. As if you thought that would have been the end of the meal, there still was dessert! This was the toughest part of the night for me since I have a huge sweet tooth, but since everyone was going for the enticing s’more and creme brulee, I went for the sponge cake. Long story short, it was all good in the hood aside from a couple bumps in the road. First, there was my financier sponge cake. The name of the cake comes from either the traditional rectangular pan that made the cake resembling a bar of gold, or the cake became popular in Paris’ financial district. It was moist, light, and spongy in texture with a strong almond taste that was enhanced with the Coca Cola foam that was the right kind of funk I like in my meal and a classy caramel drizzle. The cherry on the side was a nice touch. Then the burnt marshmallow s’more ice cream was an interesting concoction. 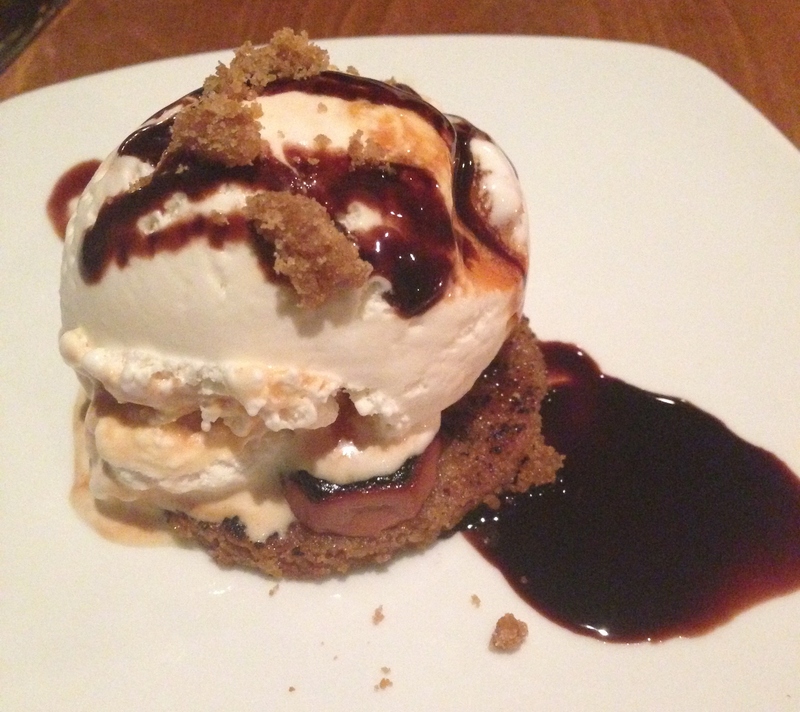 It was composed of the vanilla ice cream on top of a layer of burnt marshmallows that then topped a graham cracker cookie which was drenched with Lindt chocolate sauce. Diabetes? I haz it. Alyssa offered me a bit of hers, but I swear the cookie was made of hardtack since neither I nor Aaron could break it. Thankfully, Aaron’s was more normal, but it might prove to be too sweet for those of you who enjoy more savory plates. 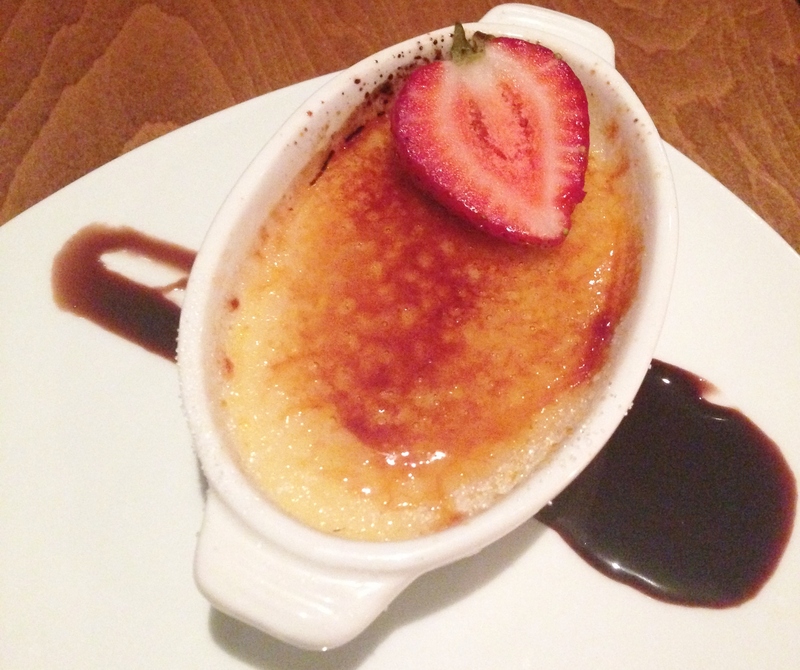 Finally, there was the creme brulee that Janice wasn’t digging too much, but I found it to be good, not great. As we sunk further into our chairs, food comas coming over us quickly, we ended the our first night in Toronto there, and it was a sign of greater times to come! I highly recommend Insomnia to those visiting Toronto if you’re looking for delicious comfort food with a twist.